We may have just seen the reveal of the release date for AMD’s upcoming Radeon R9 380 GPU, as well as fuel for an interesting rumor. This came to us through a press release from HP regarding their new HP ENVY tower series, which can be equipped with either a Nvidia GeForce 980 or AMD R9 380. Now, in my mind, this heavily implies that the cards are of equal, or at least comparable strength. This kinda of leads back to a rumor that was floating round a while back that the R9 380 is just a rebranded R9 290X. If you remember, there was an image of the 380 that looked like a 290X when comparing the PCB. The more interesting part though, is at the bottom, regarding the price and release date. The HP Pavilion, HP ENVY and HP ENVY Phoenix Towers are expected to be available in the United States on June 10, 2015 at www.hpshopping.com. With a starting price at $699.99 is the HP ENVY Tower and $899.99 is the HP ENVY Phoenix Tower. So, there you have it. 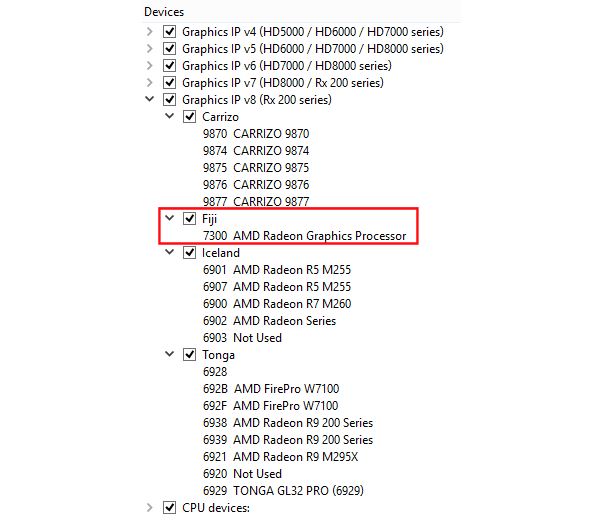 We can reasonably expect the Radeon R9 380 to release in June! However, the news doesn’t stop there. I promised you other goodies, and damn it I’m going to give them to you. The next item on our agenda is the fact that AMD Fiji was spotted in CodeXL. Just in case you’re unaware, CodeXL is a tool suite intended for developers to help them harness AMD GPUs, CPUs and APUs as well as serving as a debugging tool. Below, you can see the leaked image of the listing for Fiji. Credit to AnandTech user Glo for the screengrab. What does this actually mean though? Mostly, it means that AMD Fiji is close to release. Secondly though, the device ID was previously occupied by Bermuda, so Fiji = Bermuda. Tagged with 380, 380x, AMD, fiji, PC, PC gaming, release date.